Firewood area almost cleaned up. The piles of stoney dirt will get carted out to the back garden. The wood that's already there is left over from last winter. The old saying goes that “firewood warms three times: First, in the cutting; second, in the stacking; and third, in the burning.” I’m here to say, as I wipe the sweat off my temples and flap my arms in an attempt to cool and dry my damp, aromatic body, that old saw is true. This morning I got a start on stacking our firewood for the upcoming cold and (with luck) wet season. With the exception of a big bruise on the ball of my thumb, my hands are holding up pretty well. A bit sore, but much less so than I expected after digging seven yard-carts full of dirt and rocks off the broken old cement pad where we store our wood. I was glad to do it, though. Last year when it rained, the whole area was a morass of thick, sticky mud, and as we used up each 1/4-cord of wood, there was that much more mud to walk across to get to it. That meant tracking it into the house each time we brought wood in for the fire, which meant the floor had to be mopped afterward, etc, etc. This year there will still be mud — I’m not fooling myself — but there will be a lot less of it. And while finances don’t stretch that far right now, next summer I’ll get a load of gravel in to cover the pad before we stack firewood again. Temps here have risen suddenly, and we’ve got several very warm (OK, hot) days coming up through the end of next week. So I’m stacking wood in the very early hours, while it’s still relatively cool and shady. It works out well this way, really — it limits the amount of time I can spend stacking, which is the smarter way to go for someone with rheuma. I have to give it up for the day (or at least until sundown) and rest. Of course, there are always other things to do, but they aren’t quite so labor-intense. I enjoy working my body hard. I like the “good” tired feeling that comes with it, and hard physical work is something that I haven’t done a lot of during my lifetime. I’ve always had desk jobs, so being physical was limited to recreation. Sometimes, as I’m hefting those heavy stovelengths to stack them, I think it would have been nice to be an outdoor-worker. Someone who used her muscles every day to accomplish something more than burning calories or toning. Body-work that made something happen, like plenty of wood stacked for the winter, or a house built, or a trail blazed, or … you get my drift. Well, it’s a bit late in my life to go into construction (and that field is a bit depressed at the moment, anyway). I guess I’ll be content with the good work I have around here, and be glad that I don’t have to do it every day. With rheuma, I’d probably have been out of a job a long, long time ago. Have a great day, gang. It’s amazing how much work it is to stack firewood. And I agree, it’s much better to get exercise doing real work, than expending calories on a treadmill. Looks like you’re making good progress. Enjoy those warm fires this winter! Oh my goodness. I’m tired just looking at the stack of wood! I know the budget is tight, but you might try getting 1/2 dozen or so paving stones to use as stepping stones across the mud. 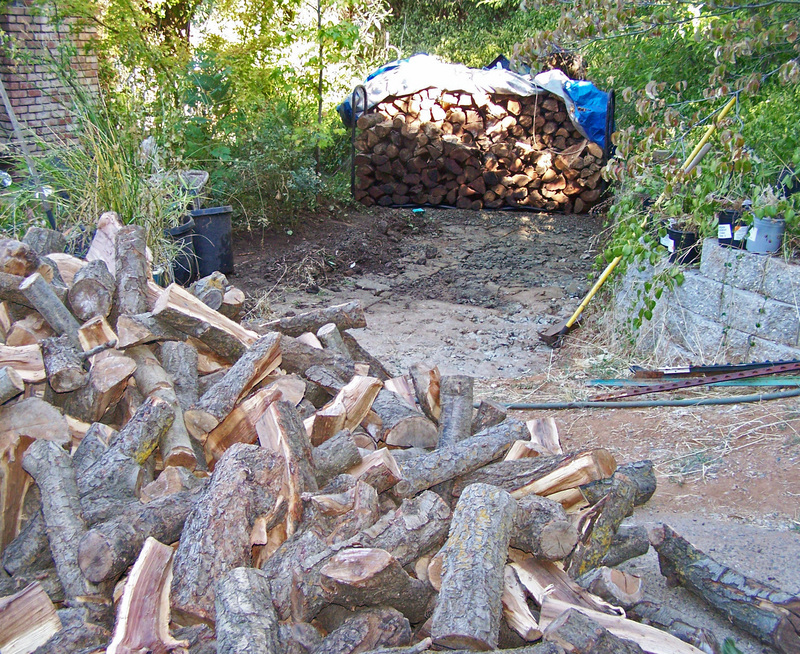 In Dallas the 18″ square concrete ones are only a couple of bucks, so for about $20 you could have a fairly mud-free path to the wood stack. I’m envious of weather where you need wood fires for warmth. In Dallas, fireplaces are pretty much for decoration. I love to work my body hard too. I can already invision you snuggled up next to the fire. Actually, this morning our house is cold and a fire sounds perfect.